Roll up, roll up, one and all! Let me take you for a brief walk through my world of wonders, my carnival of cretins, my celebration of sycophants, the one, the only Vanity Fair! What? Leave you to walk unguided through my novel alone? 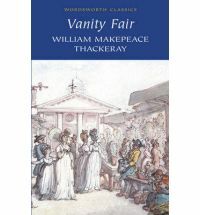 Never fear gentle reader: there is a vicious social world out there, so Mr. Thackeray will be with you every step of the way, to protect you from the worst of the inhabitants – and perhaps from your self. What’s that you say? The gentleman over there? That is merely William Dobbin, a military man and an all-round good egg, but he is not the main attraction here, the just and sensible are peripheral figures in our world. The lady he is secretly (but nothing escapes my eyes) gazing at in admiration? Ah, that is Amelia Osborne (Sedley as was), pretty, charming, demure… not to mention boring as batsh.. But we move on. The plump young (well, not old) gentleman across from her, twiddling his moustaches and loudly proclaiming his role at Waterloo to all and sundry (and what a role that was – if you are interested in cowardly retreats)? Mr. Joseph (Jos) Sedley, one-time revenue collector in India, current bon vivant and on the lookout for women with a matrimonial gleam in their eye. Oh no, you misunderstand me; I mean so that he can run away from them, of course! Now this gentleman here, once a fine young man, but now become dull and stolid (I wonder how…), this is Rawdon Crawley, another of our military friends, one who actually did fight at Waterloo with soldiers with guns (and not just with cunning menservants). Sorry? Ah yes, you do right to dismiss him. This poor soul is no longer what he used to be, mainly because of… There you go! I wondered how long it would take for you to spot her! Who is she? What?! You’ve never heard of Mrs. Rebecca Crawley (plain old Becky Sharp to her oldest friends – and debtors)? One of the brightest lights of the London and Parisian social scenes? Well, I suppose in the strictest sense she is rather a new arrival, but her sparkling conversation and quick wit quite make up for any unease you may feel about the rumours which… What rumours? Well, some people (cruel people of course, but we must consider all information before forming our judgement) believe her to be of extremely obscure origin, and I did hear tell of a liaison or two (or five – people can be so mean) behind Mr. Crawley’s back… But look at her; how radiant she is! How could a woman with a face like that be capable of any of those deeds? Easily? Well, perhaps you’re right; I am, after all just a simple narrator here. I’m sure you know best. I suppose I should explain what this Vanity Fair I mentioned is. Yes, quite right, it does draw upon the idea outlined in Bunyan’s ‘The Pilgrim’s Progress’. A year-round fair, a never-ending, global-encompassing, dazzling and intoxicating sensation for the sensuous and sentimental (if not for the spiritual). It’s a picture of a consumer society, ahead of its time, a place where wit and beauty can make a fortune (always provided that virtue and honesty are safely ignored). Exactly as good Ms. Sharp… I mean Mrs. Crawley, has done. Yes, it would be good if the just, the good, the meek did inherit the Earth. Still, never mind, eh? Maybe they’ll do better in the next life (they can’t do much worse…). Love it Tony, very apposite. All IS Vanity Fair.